I was on a committee supporting the need for a homeless shelter in Eau Claire. We attended a training seminar covering mapping and one-on-one interviewing. It was a helpful evening. It not only gave our group more focus, but also let others in the community know of the upcoming homeless shelter, which recently opened called the Sojourner House. I have been a part of Clear Vision since the beginning – and love how it positively and productively works on the tough issues in our community. I attended a Clear Vision Eau Claire meeting which was held at Peace Lutheran Church in 2008. I heard a variety of local citizens describe their vision for our community with more free activities, more art, more connection to our downtown, collaboration with non profit, private business and our city. The vocal desires of those attending Clear Vision spurred me to take action by contacting sculptors, other city sculpture programs, Eau Claire City employee’s and council members, a variety of business owners and leaders in our community to launch “Sculpture Tour Eau Claire”. Sculpture Tour Eau Claire is a true collaboration of many volunteers and organizations. I was well aware of a community-city Sculpture program for many years before Clear Vision. I never thought about organizing a group of local people to start a community sculpture program until I experience the motivational inspirational conversations from many people during the Clear Vision public meetings. Staff at The Community Table calls Community Day, Miracle Day! 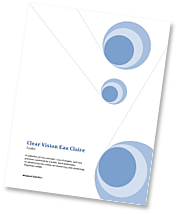 Thanks to Clear Vision, [guests] have had the opportunity to learn about over forty community resources available to them such as Food Share, Energy Assistance, flu shots with the addition of weekly music! Thanks to Clear Vision for their work in making Eau Claire a healthy, caring community. Americans concerned about civic renewal and democracy are watching Eau Claire, which is already regarded as a leader in constructive civic work. Clear Vision Eau Claire is an impressive next step that will set the standard for other American cities. Clear Vision is a great example of how government and citizens can work as partners to solve public problems. It is a model for the nation and we are happy to be involved in the process with you.